357 Magnum pistol shadow box [PLA-319M] - $189.95 : Metalcraft by Blair - military gifts and memoribilia. 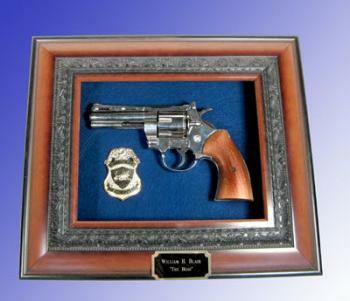 We added this 357 Magnum and badge lawenforcement award so as to allow it to be hung on the wall--- keep in mind we have as a sit down flat or hang on wall presentation. If looking for a TOP GUN Award then this is it.